On Friday May 11th the trade winds were down a couple knots from earlier in the week but continued to gust to 20+. We motorsailed out of Waterlemon Bay and then began tacking up the channel between St. John and Tortola, in the process getting a good view of the giant pile of post-Irma debris on the SW side of Tortola that had supposedly spontaneously caught fire a few days earlier and still wasn't quite extinguished. Eventually we were able to lay Privateer Point and then ease off into Coral Bay. There was some pretty big wraparound swell coming from the south side of Norman Island into the bay, and I suspected a lot of it would work its way into Coral Harbour. When we got there, it didn't really matter - the anchorage was far too choked with derelict local boats plus sunken boats marked by floats for us to squeeze in. Instead we moved a mile south to Johnson Harbor, where the reef off the point knocked the swell down nicely and we were able to find a perfect little patch of sand to drop the hook in and fall back into the protected area. It was a bit of a wet dinghy ride into Coral Harbor, but I'll trade a sporty dinghy ride for a smooth and safe anchorage any day of the week and twice on Sunday. There's not a lot at Coral Harbor, it's considerably smaller and more spread out than Cruz Bay. The dinghy dock is well away from the grocery store (which is near the water, but nowhere convenient to land) so we got in a bit of a walk around the smelly salt swamp and grove of pretty beat-up mangroves at the head of the bay. Contractors were hard at work erecting new power poles - they're getting pretty close to reestablishing power to the entire island, and there are a lot of handmade signs at local businesses thanking them for their efforts. The Coral Harbor Dolphin Market isn't quite as good as the Cruz Bay branch (which is good indeed) but it was still decent for the size of town and we were able to find most of what we needed. On our way back we went just past the the dinghy dock for happy hour at the renowned Skinny Legs Cafe. They were cool about us bringing Piper in, and the waitresses fawned over him the entire time, a pretty common reaction. Over the course of this season Piper has become far more comfortable around strangers. The next morning we sailed out of Coral Bay, around Ram Head point, and down to Great Lameshur Bay. There was still a big SE swell running and I was worried about how messy the bay would be. There was nobody in there when we arrived; by tucking ourselves into the very last mooring ball we were able to get out of the worst of the surge, and it ended up being a reasonably comfortable anchorage. I spent all afternoon scrubbing Windbird's bottom, which I'd let go far too long. It wasn't as noticeable when we were sailing, but the fouling was quite apparent when motorsailing into a stiff wind. Even using our Snuba rig, it took well over three hours to scrub the bottom and running gear clean. Dawn spent the time doing other boat work and taking Piper for a paddleboard ride. My reward for Saturday's hard work was Sunday Funday. We started with a nice hike out to Yawzi Point, the peninsula separating Great and Little Lameshur Bays, then walked along the road up the hill to where we could get a little cell phone signal to call our respective moms and wish them a happy Mother's Day. We finished our hike with a climb up the Tektite Trail to its overlook of Great Lameshur Bay. In the afternoon, we loaded up the dinghy and cruised over to Little Lameshur Bay where we tied the dink to a mooring ball and jumped in to snorkel the eastern shore. It was just ok at first - it was shallow and the coral had been damaged by Irma - but as we got out towards Yawzi Point the snorkeling got better and better, albeit more challenging due to some pretty big waves which broke over the shallowest bits of the reef. Dawn hung back while I explored, then I had to come get her because it was too good to miss. The reef has a ton of fish and soft corals, and is criss-crossed by 20-35' deep canyons, two with arches you can swim through at around 20' depth. We'd done some snorkeling in Caneel and Trunk Bays and at Waterlemon Cay, all of which are shallow and were damaged by Irma; this was the first site I found that matched St. John's reputation for excellent snorkeling. On Monday morning the wind had backed about 10 degrees, to ~095°, turning our sail to St. Croix into a 35-mile close reach rather than a hard beat. That was a good thing because the waves were pretty big, mostly a steep 6' with a few 7 or 8 footers thrown in there. It had been quite a while since we'd done any unprotected open-ocean sailing...the Mona doesn't count since it was calm when we crossed, so I guess the last one would have been our passage from Provo to Luperon. Anyways Piper was a bit uneasy at first but eventually settled down. We made good time, I "put some in the bank" by steering about 10 degrees above the rhumb line, and when we were 15 miles out I was able to come down and turn it into a nearly beam reach. We sailed most of the way down the Old Schooner Channel into Christiansted Harbor, then spent 30 minutes motoring around looking for a good protected place to anchor. There were none; the only protected spot, behind Protestant Cay, was crowded with local boats (though fewer derelicts than St. John). So we anchored in a quasi-protected spot on the north side of Gallows Bay, which at least had the advantage of being near a public park with a decent beach for landing the dinghy for Piper's potty runs. The anchorage ended up being the choppiest and rolliest of the season, and we probably would have left after a few nights except we ended up liking St. Croix so much that we extended our stay by several days. Next post, Exploring St. Croix. Prior to this cruise, my knowledge of the "Virgin Islands" basically extended to the popular parts of the BVI plus St. Thomas airport, ferry terminal, Charlotte Amalie, and Red Hook. I've never had a very high opinion of St. Thomas - and still don't. It's too crowded, too noisy, too dirty, too crime-ridden, with too many cruise ship passengers waddling between too many jewelry stores and souvenir shops. Mind you, there are places I like in the world that are crowded, noisy, dirty, and beset by pickpockets and tourists (offhand, Bangkok comes to mind)...but those places have charms to offset the negatives. St. Thomas is just woefully short on charm, and that opinion has solidified as I've become familiar with the other Virgins: Culebra, Vieques, St. Croix and especially St. John. The contrast between St. Thomas and St. John is all the more stark for them being a stone's throw away from each other. Basically, we're all lucky that the Laurance Rockefeller bought up a good chunk of St. John and donated it the National Park Service to form the nucleus of Virgin Islands National Park, thereby preventing the developers from ruining it as they did her sister to the west. We picked up a mooring ball in Caneel Bay, just off Honeymoon Beach, on the afternoon of May 3rd. We noticed Pura Vida on a nearby ball but they were not on the boat; we had seen on Facebook that Ainsley's mom was in town and they were hanging out with her. We took Piper for a potty break on the beach - which is signposted no dogs, so we kept him on a leash and took him more inland to do his business - and then headed to town (Cruz Bay). We landed the dinghy at the National Park Service office, visited it and got a hiking map of the island, then headed to the nearby St. John Brewers Taptoom. I've enjoyed their beers for years - particularly the Island Hoppin' IPA - so it was a treat to visit them in person. Afterwards we had an early dinner at Rhumblines, a pan-Asian restaurant and bar with a killer happy hour (half off all drinks and shared plates, of which they have about 20 awesome creations). On Friday morning I was busy with boatwork when someone rapped on the hull. To my surprise it was Stephen from S/V Carpe Ventum - I hadn't seen their boat in the anchorage. We chatted for a bit and agreed to meet that night in town. We didn't know where they'd be - but Cruz Bay is pretty small! Indeed, Stephen and Luiza saw us walking on the street and shouted down at us from the balcony of the Quiet Mon Pub, an unique Irish-Rasta bar. They introduced us to John and Belinda from S/V Be As You Are, another couple on the thorny path we'd heard about multiple times but hadn't yet met. John and Belinda had been coming to St. John for about 15 years before they bought a boat, so they knew the island very well. John, Belinda, Stephen and I made plans to hike early the next morning (plus Piperdog) - plans that were thrown a bit into doubt when both couples came back to Windbird for a nightcap and stayed very late! To our mutual surprise, everyone showed up on Honeymoon Beach at 7am. We hiked up the Caneel Spur trail to the coast road and then up Caneel Hill. The trail wasn't as steep as I expected until the very top, and it was something under 800' vertical. John and Belinda were planning to go down the hill via the west side for coffee and banana bread at the North Shore Deli in Cruz Bay, but Steve and I elected to keep going up to the next, taller hill and then down to the coast road near the entrance to Caneel Bay Resort. We had just topped that second hill when John and Belinda caught up to us - they had decided to do the full hike after all. The entire thing ended up taking about 2 hours; unfortunately a security guard wouldn't let us onto the currently closed Caneel Bay Resort (a classic eco-resort created by Laurance Rockefeller that took massive damage from Irma), so we had to walk back via the coast road. I invited John and Belinda over to the boat for breakfast, and told Stephen to spread the word that everyone was invited that afternoon for a combination Kentucky Derby / Cinco de Mayo party. It ended up being quite the full boat: John and Belinda, Stephen and Luiza, the four Keys from S/V Pura Vida, and a French-Canadian couple who are friends with Stephen and Luiza (don't recall the boat name, though). Everyone brought food to share - we grilled up some Carne Asada that had been marinating all day - and I mixed up lots of Margaritas and Mint Juleps. Unfortunately our AT&T data connection wasn't the best and our stream of the Kentucky Derby cut out halfway though the race! We restored it to see that race favorite Justify had won by two lengths. The party went fairly late, though everyone said they wanted to go hiking in the morning. I had my doubts. To our mutual surprise, everyone again turned out for hiking at 7am! We again went up Caneel Hill, but this time took the west trail down to town for breakfast at North Shore Deli. We then returned via the coastal trail, all in all a very nice hike. As always, Piper sure seemed to enjoy the exercise. We usually take him off leash while hiking; he's very good about scouting a bit ahead and then returning or waiting for us to catch up. After returning from the hike I ran a bag of garbage into town and then we motorsailed over to Maho Bay. 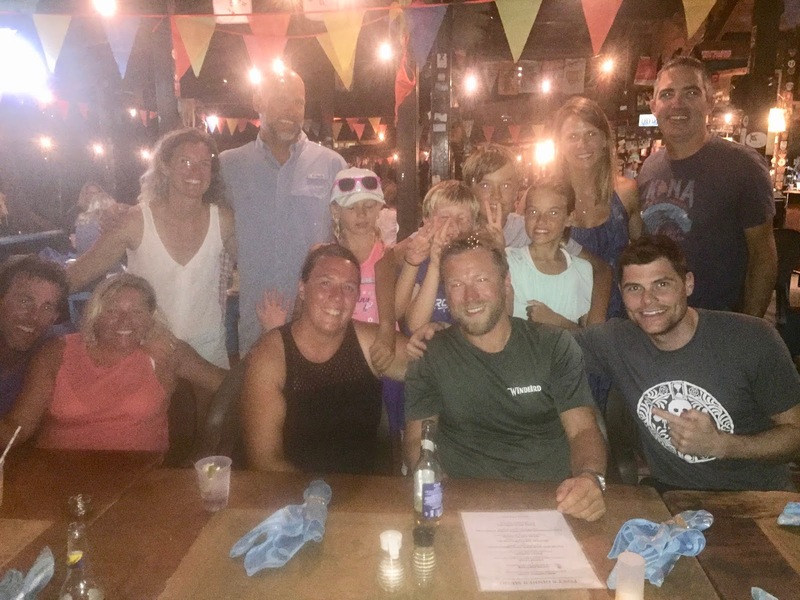 S/V Be As You Are was staying in Caneel Bay as they had to reposition to St. Thomas in a day or two, while S/V Pura Vida jumped over to the BVI to rejoin Vela, Rondo, Savannah, and Britican as they waited for a window across the Anegada Passage. S/V Carpe Ventum, however, came over to Maho shortly after us, which was nice as we'd been getting to know Stephen and Luiza. They're a friendly, energetic couple in their early 30s, who recently got engaged. We really liked Maho. It is far more protected and calm than Caneel, which was pretty exposed to wakes from the ferry boats that regularly pass nearby. The beach is gorgeous, and there are tons of sea turtles in the bay. During our three days there we and Carpe Ventum snorkeled, paddleboarded, hiked from nearby St. Francis Beach to the ruins of the Annaberg Sugar Plantation, and took a dinghy adventure over to Trunk and Cinnamon Bays. Finally on the morning of the 9th they took off for St. Croix, from which they planned to cross the Anegada Passage to Saba or St. Kitts. Meanwhile we headed over to Waterlemon Bay, via an excruciatingly slow passage through The Narrows against 25 knots of wind, big waves, and 2 knots of current. Waterlemon was perfectly protected, though, and there we spent two days hiking to nearby ruins and snorkeling the bay and nearby Waterlemon Cay. There was only one other boat in the bay when we got there, and we mostly had the place to ourselves. There are lots of turtles, sharks, and rays, plus a lot of smaller reef fish on the west side of Waterlemon Cay. On Thursday afternoon I was at the beach with Piper when I was approached by three older women with snorkeling gear who inquired how they could get out to Waterlemon Cay. I indicated they could walk to the end of the beach and then swim, but then added that Dawn and I were about to go snorkeling out there and I could give them a ride. I should know by now that no good deed goes unpunished! As I dropped the women off at the dinghy mooring, I learned that it was the first time snorkeling for two of them. I went and got Dawn, and by the time I returned one of them was standing on the coral-bound island (which is signposted no landing). I didn't realize it at the time, but she got pretty badly cut up by coral while getting out of the water, and later apparently brushed up against fire coral. I ferried them back to the beach and then retrieved our first aid kit to disinfect the cuts and apply butterfly bandages. The area that had touched fire coral looked terribly inflamed and I advised her to keep hydrocortisone on it and see a doctor if it was still bad after a couple days. "For future reference," I told her, "Don't touch any coral while snorkeling!" Guess I should have made that clear beforehand. Waterlemon Bay was the last protected anchorage on St. John's north coast, as strong easterlies / southeasterlies continued to feed big swells into every bay with any eastern exposure. It's been an unusually windy May (after an unusually windy winter). We planned to stop at a couple places on St. John's southeastern side before crossing to St. Croix, which was a close to beam reach that could potentially be a tough beat across 35 miles of open ocean. Next Post: Coral Harbour and Great & Little Lameshur Bays, St. John. As an airline pilot, I'm required to perform three takeoffs and three landings every 90 days. If my landing currency expired - for example, if I was not being used on reserve or was on an ultra-long-haul international fleet and didn't land often - the airline would summon me to the Atlanta training center where I would reestablish landing currency in a flight simulator. Per my union contract, they'd put me up and pay me my usual rate. However, the contract is pretty silent about what happens when the lapse in currency is the pilot's fault - if, for example, he kept dropping and trading his trips to sail the Caribbean all winter long! I've decided I don't want to know the answer; I have a good thing going and I'd rather fly under the radar, so to speak. So I've made a point of parking Windbird somewhere safe every six to eight weeks, shaving off my sailor beard, and commuting to Atlanta to fly a trip and reset my landing currency. Accordingly, I'd been planning to fly in mid-April, until another pilot asked if I'd be willing to trade him that trip. It wasn't a problem, I still had a trip at the end of the month I hadn't been able to trade away yet, but that meant it would be a full ten weeks since I'd flown last. That's the longest I've gone without flying at my current employer. Thankfully, the Boeing 757 and 767 are well-designed, intuitive airplanes to fly and I had little doubt that with a little prior studying I'd be able to get back in the saddle after 10 weeks and fly safely. But first I had to get to Atlanta, and that proved to be more of a problem than anticipated even though I started travel the day before my trip. My airline ID had expired in March, and I hadn't been to Atlanta since then to pick up my new one. I'd talked to the chief pilot's office and they assured me it was no problem, I could pick it up before beginning my trip. However, I wouldn't be able to jumpseat with an expired ID. That didn't seem like a problem until the St. Thomas-Atlanta flight filled up in the last few days. When I checked in at the airport there were still nine seats available, but unfortunately the flight was load limited. St. Thomas is a relatively short runway with a hill right off the end of the runway, meaning that we occasionally have to leave passengers or cargo behind to have the required engine-out performance. The airplane's basic operating weight includes a jumpseater so I would have been fine if I could occupy a jumpseat, but as a passenger I was out of luck. Even as #1 on the nonrev list, I didn't get on the flight. That sent me scrambling. All the afternoon flights were leaving about the same time. I tried American, United and jetBlue, but without the ability to jumpseat I needed empty seats, and everyone was full. I tried Cape Air to San Juan, but Seaborne had just cancelled a flight and filled them up. Finally I discovered that the next Cape Air flight had a single seat for sale. Rather than risk nonrevving I bought the seat; the agent was super nice and gave me an industry discount. That got me to San Juan at nearly 6pm, just as the last northbound flights were leaving. I got a hotel near the airport and flew out on the first flight to Atlanta the next morning (lots of seats open, thank goodness), which got me in several hours before my trip's report time. The four-day trip was an easy one, with a 30-hour layover in Jacksonville and 15 hours in Salt Lake City. The first leg was a bit awkward, as it always is after an absence, but the second leg onward felt like I was right back at home. I kept in touch with Dawn back at Brewer's Bay in St. Thomas, and everything went well there. She was finishing up a major round of varnishing she'd begun in the BVI, and one day a fellow cruiser (Dave from S/V Tina Marie) gave her a ride into town to do some reprovisioning. The beach at Brewers is super nice for dinghy landings and Piper running. Sea Otter came in a couple days earlier than planned, and then Dawn had Dane and Mak and Isla to keep her company. My trip ended late on April 30th; I flew to St. Thomas on May 1st and arrived at 1pm. Dawn and Dave picked me up, and after stopping at the boat to change out of my monkey suit and discard my shoes and socks for another couple months we headed over to Sea Otter. This was the last we'd be seeing them before they headed up island and back to the states, which made us pretty sad. We understand why they're selling the boat, though. After a beer on Sea Otter we decided to ride the Safari Bus over to the area near Yacht Haven marina and the cruise ship dock (since none were in port). There we went to an open-air cocktail bar and played bocce ball and giant jenga, had dinner at the Tap & Still, and watched the Jets and Raptors playoff games (Sea Otter being from Winnipeg) at the Smoking Rooster. It was wayyy past Isla's bedtime when we took a taxi back to Brewers Bay, but Dawn and I went over to Sea Otter for a nightcap and cigars (for Dane and I, anyways). It's been fun hanging with those guys this season. In July Dawn and I are planning to take our motorcycles up to Winnipeg for a visit. Early the next morning Sea Otter lifted anchor and made a close pass as we saluted them with our conch horn. We were sticking around an extra day to get together with Dave and Tina on Tina Marie, but they ended up having to cancel. Instead I worked to pickle our watermaker, which has a persistent leak that I've tracked down to a small crack in the pump housing. The leak itself isn't a big deal except it allows air to get into the pump, which makes it cavitate. I'll be taking the pump out of the boat in the next week or so, and we'll repair or replace it this summer. On the morning of the 3rd we motored around the airport, past Water Island and through Haulover Cut to Charlotte Amalie harbour and Yacht Haven Grande. With the watermaker out of commission, we needed a full load of water (170 gal) for our last month of cruising. Yacht Haven's fuel dock is quite easy to get on and off, and the water was reasonable (¢20/gal). After that we set sail for St. John, which was a pretty good beat in strong southeasterlies. A port tack took us west of Buck Island, but from there we were able to (barely) lay Cow Rock and Current Cut with one short-tack around Long Point. After squeezing through Current Cut, Pillsbury Sound bent the wind pretty far south and we were able to lay Cruz Bay on a close reach. Unfortunately, local boats took up every last potential anchoring spot, so we went around the corner to Caneel Bay and grabbed a NPS mooring ball. Usually they're $26/night but post-Irma the park service is not collecting mooring fees. For the next ten days we'd work our way along the north coast of St. John, hiking and snorkeling, and then sail around to the SE side, from where we'd take off for St. Croix. We'd previously only spent one night at St. John thus far but had heard good things from our cruiser friends, and we were really looking forward to exploring the island for ourselves. As it turned out, we had good company for the first half of our stay and almost perfect isolation for the second. Dawn and I are sporadic buddy-boaters at best. While we're fairly social and have made a lot of great friends out here, we also decided early on that in the interest of comfort and safety we would sail our own boat and keep our own agenda. This has resulted in us buddy-boating closely with other boats for relatively short periods of time, or very loosely buddy-boating for longer periods, or sporadic combinations thereof. Our "closest" buddy boaters this season were Dane, Mak and Isla on S/V Sea Otter, but we actually only did two passages together, from Mayaguana to Provo and from Provo to Luperon (and three weeks of waiting in Provo in between! ); since then we've met up in several places in the Spanish Virgins, BVI and USVI. Our friends Erin and Kara on S/V Vela were on a fairly different schedule than us this year, but we met up in Cape May, NJ, a couple places on the Chesapeake, Samaná DR, and throughout the BVI. We knew beforehand that our friends Lance, Chris and Mark would want to buddy boat with us while they chartered in the BVI, and we did spend several days with S/V Jada. What I didn't expect was that my birthday would kick off two weeks of buddy-boating with a good half-dozen boats! Dawn joked that my party never really ended. It was a dramatic change from the previous two weeks when we'd been slow-cruising the BVI by ourselves and getting boat work done. Now, sail every day and party every night became the name of the game. It was a lot of fun - but I'm not sure I could do it all season long (and Dawn definitely wouldn't want to do it for longer than we did)! On April 18th we sailed back over from Jost van Dyke to Cane Garden Bay, a two-tack beat on a somewhat squally day. We were joined there by S/Vs Jada, Sea Otter, Vela, Savannah, and Carpe Ventum. In the afternoon we hung on the beach for a bit with Sea Otter, and then us, Jada and Vela walked over to the Callwood Distillery for a short tour and rum sampling; we subsequently hired the kid who working there (and about to close up) to drive us up to Stoutt's Lookout Bar for sundowners. That night we hung out with Jada and figured out our onward itinerary. The next morning Jada, Windbird and Vela all left Cane Garden Bay at about the same time, and naturally a sailboat race ensued. It was a hard beat up to Guana Island, and I'm happy to say Windbird took line honors despite an accidental 360 when we were trying to come up to the wind to reef. I wasn't surprised to beat Vela, an IP40; while Island Packets are good stout boats, they're known for being not particularly weatherly on account of their shoal draft and full keel. But Jada (a new 48' Beneteau) should have been much faster and more weatherly than us, so I had to give Lance some ribbing over us beating them. We snorkeled at Monkey Point, after which Vela decided to return to Cane Garden Bay (and give up all that easting!) while Jada stayed with us as we motored another mile east to Lee Bay on the west side of Great Camanoe Island. It was my first time there, and I really liked it - since we were the first two boats in and were able to snug right up to shore and anchor in good sand. A number of other boats came in after us, and had a lot of trouble getting their anchor to set in the surrounding rock and coral. With polarized sunglasses I could see the available sandy spots as plain as day but none of the charter boaters could seem to find them; after several gave up and went elsewhere, a cruising catamaran zipped in, dropped their hook on the bullseye, and fell back pretty as you please. On Friday morning Jada left early to drop Mark and Jim off in Trellis Bay so they could catch their flights out of the Beef Island Airport. Dawn and I were considering spending another night in Lee Bay, as seemed quite protected and calm though you get the full breeze from a low point on Great Camanoe Island. The downside is that, post-Irma, the former white sand beach is covered with large rocks and small sharp coral bits, making landing the dinghy a challenge. Piper hates beaches like that too; though he'll do his business, we try to get him some exercise during his shore visits. On Friday afternoon I ran Piper over to the nearest sandy beach, on Little Camanoe Island about a mile away. When I got back some wraparound swell had started to work its way into Lee Bay so we decided to leave after all, joining Jada in Trellis Bay. Lance's crew and guests for the second half of his charter wouldn't be arriving until the next day, so it was just him and us for the night. We left Trellis early on Saturday morning, for we had a long beat ahead of us. We motorsailed clear of Scrub Island Sound but then killed the engine and headed ESE on a port tack almost to Fallen Jerusalem, then NNE on a long starboard tack just east of the Dogs and throwing in a short tack to clear the Seal Dogs. Tacking north again off Mountain Point, we came together with a Leopard 48 - and again a sailboat race apparently ensued as he tacked to cover, ahead and slightly leeward of us. He was faster than us but wasn't pointed as high; we tacked away SE to Mosquito Rock, and when we came back together near Necker Island we were well ahead. We sailed into Eustatia Sound from the north side of Prickly Pear and dropped the hook in the lee of Eustatia Island. What a beautiful anchorage! I've been to North Sound many times but was always too chicken to go past Saba Rock and thread my way through the coral. I don't know why not, it's perfectly visible in midday light. Shortly after we arrived S/V Rondo came into the anchorage. They'd been hanging out on the west side of Virgin Gorda and we Facebook messaged them that we'd be coming to Eustatia. We really like the Rondo crew. Mike and Sarah aren't much older than us and are really great people; I think we're pretty close in temperament and outlook on cruising. Their kids Mikey (13) and Katelyn (12) are adorable, well-adjusted and well-behaved; it's been fun to watch them blossom into full-fledged cruiser kids this year, their first on the boat (we first met them in Staniel Cay, Bahamas). When we showed up, the kids served us virgin Pina Coladas and Bushwhackers they'd concocted (add your own rum! ), and then Mikey and I had a good discussion about what fish do and do not have ciguatera in the BVI and his opinions on what color of squid skirts are best for catching Mahi, Wahoo and Tuna. He's become quite the fisherman, and has started making and selling his own lures. Sea Otter had bought one to give to me for my birthday, and as it was very well built Dawn and I ordered several others. Mikey would have gone on talking fishing all day but I suggested we go catch ourselves some lobster, and on the reef just north of the anchorage in about 30' of water I managed to catch a good big one. We donated it to that night's feast on board Rondo, and in gratitude Mikey sketched up charts of all his favorite lobster holes throughout the Bahamas, for our return there in a few years! At 2pm we headed over to Leverick Bay via the Saba Island cut; Jada and Rondo went the "long" way (actually shorter since you don't have to avoid coral). We anchored behind the Leverick Bay mooring field and were shortly joined by S/Vs Sea Otter and Carpe Ventum. I dinghied to the marina and arranged with a taxi driver to bring us all up to Hog Heaven, the cool BBQ joint overlooking North Sound from high on Virgin Gorda that Dawn and I had found earlier in the month. With seventeen hungry cruisers from five boats to be ferried up the hill, the taxi driver had to take two trips but it worked out well as the restaurant was able to clear three tables to push together right as the second load arrived. It was a really nice night, almost a repeat of my birthday bash, except with fantastic, inexpensive food this time. Everyone raved over Hog Heaven. I now consider it a BVI must-do. After coming back to the boats, we hung out with Dane, Mak and Isla on Sea Otter as it was the last time we'd see them in the BVI. Originally bound for Trinidad, they had concluded that cruising with an infant was too difficult, especially since they're planning to have another kid soon; they decided to return to Florida and put the boat up for sale. We'd see them once more this season, though; we made plans to meet in St. Thomas early in May. With the last easting of the season behind our transom, it was time to enjoy some downwind sailing. On Monday morning we headed out of north sound ahead of all the other boats except Rondo, sailing all the way down to the Baths. It was already a zoo when we got there and instead of fighting for a mooring ball we elected to anchor just north in Trunk Bay. It was a pretty choppy, rolly anchorage but we weren't staying on the boat; we swam ashore to tromp through the Baths and relax on the beach at Devil's Bay. We were eventually joined there by Rondo, and then also S/Vs Jada, Pura Vida (who we hadn't seen since my birthday) and Britican, who we'd heard a lot about but hadn't yet met. After returning to Windbird and eating lunch we headed down to Cooper Island, where S/V Vela had already anchored on the south side of Manchioneel Bay. Every mooring ball was full; while Dawn and I motored east of the mooring field deciding where to anchor, we heard a mighty splash from the bow followed by a metallic scream as the anchor pulled the chain over the gypsy and straight down to the seabed 70' below! I had pulled the pin securing the anchor in preparation for anchoring, but clearly this was a bit premature; it fell off the bow roller as soon as we got into chop. Thankfully after a quick sprint to the bow I was able to arrest the chain's escape, we cranked the anchor back up with the Windlass, and headed to the north side of the bay to anchor clear of the madness of the mooring field. Jada meanwhile decided it was too full for them and hightailed it off to Peter Island. We got together with Vela for the Cooper Island Beach Club's excellent happy hour; unfortunately, they ended up spending a good portion of the night and early morning fending off charter cats that anchored way too close to them. had left, so we motored around the point. My favorite spot in the northeast corner of the anchorage was available, and this time anchoring stern-to went much more smoothly than our first time a month prior. We scooched right up to shore, and spent much of the day paddleboarding, lazing in the water, checking out the ruins on the point up the hill, and paddling over to say hi to Vela and borrow them our Snuba rig for cleaning their bottom. situated. Vela came over to Jada for happy hour and dinner; we had a perfect view of the sunset over St. John. We ended up staying up pretty late talking, drinking, and looking at the stars. As popular as Little Harbour has become, it's still one of my favorite BVI anchorages, especially in that NE corner where you can't see the lights of Tortola. And that wrapped up our month in the BVI. The next morning Jada cast off her docklines pretty early so we could take in our stern line, pull up anchor, and sail over to West End to clear out of the BVI. From there it was a long and at times rowdy downwind sail along the north side of St. John, through Current Cut, and along the south side of St. Thomas to Brewer's Bay. The wind started to ease in the afternoon and Dawn decided to get some laundry done enroute so it had a chance to dry before nightfall; I needed some of it for the work trip I was leaving on the next day. And then the wind died further and I decided to fly the Spinnaker; of course setting it up interfered with the laundry Dawn had hung out to dry, she lost a few clips and one pair of underwear overboard to flogging sheets, and by the time the kite was set we only had five or six miles left. It ended up devolving into an angry shouting match, over pretty much nothing. Dawn and I have very rarely fought throughout the 15 years of our marriage, and had got along well during the first six months of this season, but this was our third or fourth blowout in April. We were obviously getting on each others nerves; seven month of very close proximity (and ten weeks since I'd last left the boat) were clearly taking a toll. It was a good time to go make some money - and take a 5-day vacation from each other! Next post: Adventures in Commuting from St. Thomas, and our 10-day cruise of St. John. Windbird left her mooring ball in Trellis Bay bright and early on April 14th. We motored through the Camanoe Passage and then put up the sails and enjoyed a quick broad reach down to Cane Garden Bay, arriving just after 9am. During the sail I called around to a couple different car rental agencies and found a 4x4 with a small company that could pick us up in Cane Garden Bay; they arrived around 10am and brought us to West End where we picked up the Suzuki Vitara. From there we headed to Road Town, marveling at all the devastation along the way. In Road Town we did some reprovisioning and other chores, then headed back to Nanny Cay to pick up the fuel diaphragm for the dinghy outboard. We also had a really delicious lunch of West Indian Roti at Nanny Cay’s dockside restaurant, Genaker Cafe. Afterwards we picked up a few things at Nanny Cay’s Budget Marine store, then engaged in a lengthy wild goose chase for an unusually long and skinny clevis pin for one of our mainsail mast track cars (I ended up substituting a cotter pin until I can get the clevis pin from a Doyle sailmaker). By the time we got back to the boat, it was already almost time to head back across the mountain to Road Town to pick up our friend Andy and his girlfriend Ann from the ferry dock. I’ve mentioned before on this blog how our friends Andy and Lance, before we knew them, purchased a Bristol 29.9 in Bayfield WI and sailed it through the Great Lakes, down the Illinois, Mississippi, Tennessee, and Tom Bigby Rivers, across the Gulf of Mexico, through the Bahamas, and down the thorny path to the Virgin Islands. When Andy and I first flew together at Compass Airlines, we bonded over sailing stories and I subsequently invited him and Lance to bring their boat, S/V Yolo, from Puerto Rico to the BVI for the 2013 Interline Regatta (along with Chris Warrington, who had by then bought into Yolo along with Mark Tunucci). The guys sold Yolo in 2014 – after being dismasted near Culebra – but the four partners have since bought into a Moorings charter boat. Both Lance and Andy sailed on Windbird last year, from Charleston to Fernandina Beach, FL. Andy and Ann were originally planning to spend their entire vacation helping a friend rebuild his place on Vieques, but upon learning I’d be spending my birthday in Jost van Dyke, and that we’d be joined by Lance and Mark (and later Chris) on a Moorings 48’ Beneteau, they decided to detour to the BVI for the first few days of their vacation. On the 14th they flew from Minneapolis to Atlanta to St. Thomas and then took the fast ferry to Road Town’s temporary ferry terminal at the cruise ship dock, where we met them in the middle of a fierce downpour. We quickly retreated to the Pusser’s Pub (undergoing repairs after losing its second story in Irma, but still open) for a quick bite and the trip’s first Painkillers. After returning to Cane Garden Bay we walked along the road and back via the beachfront, marveling at how much had changed since Irma. Quito’s Gazebo, at which Andy and I spent several late nights during Interline, is completely gone (but being rebuilt). The friendly folks at Myett’s rasta bar lost their second story. Many of the sloping palms that graced the beach are gone, and a great many formerly invisible homes can be spotted on hillsides stripped of much of their vegetation. The Callwood distillery, once heavily shaded in a thick copse of trees, is now starkly visible from the main road. We went back to Windbird for happy hour, a spectacular sunset over St. Thomas, and dinner and conversation long into the night. It’s always pretty special to have good friends join us on Windbird. Trellis Bay to inspect the remaining beached sailboats, then took Ridge Road in search of a viewpoint to watch the sunset. We found the perfect spot, in a ruined ridgetop home that must have been pretty spectacular before the storm. Once it was dark we headed back down to Road Town, to check into Lance and Mark’s boat at The Moorings’ base and do some provisioning for them at the RiteWay. They’d originally been planning to arrive Sunday afternoon but the Minnesota weather had other plans with a springtime Snowmageddon that cancelled a bunch of flights and left them scrambling for open seats out of MSP. They eventually found a way out to Boston and then down to San Juan, where they were stuck for the night. They’d arrive to Tortola the next day on Cape Air; we were provisioning to help get them out of the Moorings base ASAP. Andy and Ann stayed on the charter boat (S/V Jada) overnight so Andy could do the boat briefing in the morning and have it ready to go. On Monday Dawn and I returned the 4x4 to West End and got a ride back to Cane Garden, then sailed over to Jost van Dyke. Our friends Erin and Kara on S/V Vela were already on a mooring ball in Great Harbour when we arrived (having sailed over from St. John and already cleared BVI customs). We poked around looking for a place to anchor but the few good spots were already taken, so we too took a ball. In the afternoon we and Vela took our dinghies and bashed our way over to Sandy Cay. The interior, formerly crossed by nature trails, was impassable due to deadfall from the storm, but we had a nice time playing beach bocce ball and catching up with Erin and Kara, who we’d last seen in Samaná, DR. When we returned, we were delighted to see that Dane, Mak and Isla on S/V Sea Otter had also arrived from St. John. Knowing that Isla would probably be staying up late on my birthday, they opted to have a quiet night on their boat, while Kara and Erin came over to Windbird for homemade grilled pizzas and drinks. S/V Jada, meanwhile, had been delayed at the Moorings base for maintenance, and ended up spending the night next door in Little Harbour (JVD). Tuesday, April 17th, my 37th birthday, dawned clear and bright. Dawn made my favorite breakfast, Mexican Breakfast Tacos, complete with her homemade corn tortillas. Then Kara and Erin joined us and Piper for a spirited hike/climb to the very top of Jost, at just over 1100’ above sea level. After return and a quick lunch, we took the dinghies over to White Bay where S/V Jada had just anchored with Lance, Andy, Ann, Mark, and Jim Corbo (a last-miute guest I knew from the Interline Regatta) onboard. After a preliminary beer or two we proceeded to shore where the Soggy Dollar Bar was already doing brisk business in Painkillers. The bar area survived Irma but the rest of the building and surrounding trees did not, and it looked so incredibly different. At least they recently replanted some palm trees; in a few years the Soggy Dollar should have lush surroundings again. It’ll never be quite the same again, though, which probably goes for all of the BVI. There will always be Before and After. been with a lot of our friends from Georgetown onward: S/V Savannah and S/V Carpe Ventum. In all we had eight boats and 24 people (and one piperdog) in attendance! It was a pretty good bash, and I was really touched that so many of our cruising friends made the effort to make it to Jost for my birthday. fantastic birthday that I’ll remember for a very long time. And now that so many of our friends on the Thorny Path had caught up with us, and with S/V Jada looking to buddy boat, my birthday bash marked the start of the last, more social phase of this year’s BVI cruise. This year was my sixth time cruising the BVI and Dawn’s third. All of our previous visits have been charters of between seven and ten days, and though I was quite familiar with many of the islands and anchorages, I felt a bit “stuck in the charter rut” – feeling compelled to return to the same familiar (and popular) spots each time, leaving little time to explore the islands’ interiors or sample the lesser-used anchorages. Thus I was pretty excited about the prospect of spending nearly a month in the BVI this year, particularly the nearly two-week span that we were on our own and not buddy-boating with chartering friends. We had a fair amount of deferred boat work that needed addressing, and twelve days on our own would give us the perfect opportunity to do boat work in the morning and hike or snorkel or explore in the afternoons, changing anchorages via short sails every few days. We started with Benures Bay on Norman Island. Benures is only two bays west of the famous and popular Bight, home of the even more (in)famous William T. Thorton floating bar, e.g. the Willy T, which Irma brutally stripped of all its Pirate Ship regalia and washed ashore a wreck. The nearby Pirates Bar & Restaurant is open again, but the new Willy T is being prepared elsewhere and should arrive in The Bight in mid-May. Even bereft of the Caribbean’s best-known buccaneer bar, The Bight’s many moorings were surprisingly well occupied during our three-night stay at Norman. Meanwhile we had Benures completely to ourselves the first night, and shared it with a couple cruisers and charters the next few nights. Tucked well inside and anchored close to shore, Benures was perfectly protected and still in moderate ESE trades. the high ridge trail. The last took place on a hot afternoon and I thought Piper was going to have a heatstroke, though we forced him to keep drinking his water. I left the two conch horns I was attempting to make near our anchor in twenty feet of water, and by the time we left the sea critters had done their job of eating out all the remaining rotting conchy bits. We had two clean and perfectly working conch horns, and we began a new nightly tradition of blowing them at sunset (I recently shipped the second one to Duncan Roberts' son, Bjorn). beaches, somewhat rubble-strewn after Irma but with enough sand for Piper to play. There aren’t any trails but there’s a hillside that is open enough for a good scramble amidst flowering Turks Head cacti to an overlook with a great view of the anchorage and Norman Island. The reef has fantastic snorkeling, and I caught our largest lobster of the season which made for an excellent meal of grilled lobster tail one dinner and lobster mac-n-cheese the next. On Day Six of our Slow Cruise, we hoisted the anchor, put up the sails, and rounded the SW corner of Peter Island to beat up the Sir Francis Drake Channel to Cooper Island. I’ve never visited before, and the Cooper Island Beach Club was newly reopened and made a promising place to visit for Sunday Funday. Along the way we got intercepted the Yacht Shots guy and he circled us beating in the light air, taking photos the whole way. He uploaded them to his website that night and there are a few excellent ones we plan to purchase and frame after we’re off the boat this season. dinghy, as she considers ghost ships too spooky for her. I was happy to see the wreck undamaged by Irma, and the water was clear enough to see the entire stern section quite well from the surface. I did quite a few freedives, including to the aft section of the bow in 60’ of water, which I think is a new record for me. I also swam through the propeller aperature of the stern, which sits in only 20’ of water but is a fairly long and intimidating-looking swimthrough under the overhanging hull. I remembered fitting through easily with BCD and tanks on, and it ended up being pretty easy. 1 Part Cream of Coconut mixture (2/3 Coco Lopez, well-mixed, and 1/3 Sweetened Condensed Milk). Pour over ice from one cup to another, and grate fresh nutmeg on top. companies place this anchorage off-limits) and pick our way through the scattered coral heads inside. We worked our way up into Pond Bay where we anchored in 11’ over deep sand, close enough to the beach to keep the chain away from coral. The nearly awash reef just west of us broke up the wraparound swell that makes the rest of Virgin Gorda’s west shore notoriously rolly. It was a fantastic anchorage with beautiful water, few other boats, and gorgeous sandy beaches undamaged by Irma. Piper loved it. That afternoon we took the dinghy on a two-mile expedition to Spanish Town, which wasn’t nearly as wet a ride as I feared thanks to ducking behind numerous headlands and Dix Bay along the way. The Virgin Gorda Yacht Harbor was newly reopened, with most of the docks repaired and sunken boats removed, but the boatyard is still a mess and several of the surrounding buildings are wrecked. The friendly dockhand said it was $2/person to land but they’d waive it if we bought a drink at the marina bar (the only remaining business in one of those wrecked buildings). We thanked him and set out on foot for the RiteWay grocery store 15 minutes down the road. We found most of our needed provisions and a few extra things there, and bought the requisite drinks on our return to the marina. On Day Eight we continued chipping away at our boatwork list, which was going rather well. In the afternoon I took another dinghy run to town, this time to drop off a bag of trash and buy a bag of ice for our continued Painkiller expirements. On the way back, the dinghy outboard began noticeably losing power until it was barely planing as I approached Windbird. The 15 horsepower Yamaha Enduro 2-stroke hadn’t been running quite right ever since Georgetown in the Bahamas – it suffered from slow acceleration at low RPMs, and even once spun up seemed to lack its former pep. I’d been through the carbs twice, had inspected the entire fuel system several times, changed the spark plugs, and tried all the other usual suspects to no avail. I was at a loss but the outboard still ran well enough to cope. Now, I was worried that it was taking a turn for the worse. Thinking that perhaps I had a batch of bad gas, I mixed in gasoline from our second jerry can and cleaned out the fuel filters. On Day Nine we had a really fantastic beat up the NW side of Virgin Gorda, past Mosquito Island, tacking out at Mosquito Island and then in through the cut through Calcouhoun Reef. We sailed all the way to the mooring field at Leverick Bay and actually attempted our first time mooring Windbird under sail – but I came in a bit too slow and then started my turn up to the ball too late. Whoops. I started the engine while Dawn dropped the mainsail and we sheepishly nabbed the ball on our second approach. A couple on the next-door cruising boat witnessed our aborted hotdogging; we talked to them while doing laundry and they turned out to be from upstate Minnesota; he's a retired Fedex pilot! Sound. Wow, as many times as I’ve been to Leverick Bay, how did I never go here before? It’s a fantastic spot, with lovely views, a nice atmosphere, super tasty BBQ, and reasonable (for the BVI) prices. Back at the boat, we relocated out to the Prickly Pear anchorage where we spent the night on the hook. Very nice and calm. I'd been hoping to run out to Eustatia Sound for a little lobster hunting but didn't dare with the ailing outboard. Instead Piper got some extended beach play time near the restaurant on the S side of Prickly Pear, which was destroyed by Irma but is being rebuilt. On the morning of Day 11 we sailed back out of North Sound and enjoyed some downwind sailing for once, a quick hour-and-a-half to cover the 9 miles back to Spanish Town. It was a dark, gloomy, squally day, and Thomas Bay was its usually messy, rolly self. I loaded up my tools and took the dinghy into Virgin Gorda Yacht Harbour, ever so slowly. The main Yamaha guy at the dealer, Chris, was quite busy, needing to get a lower unit back on an outboard for a client that day, but agreed to look at my carb and reed plate for me if I’d take them off the engine. I’d done this several times already so it was a quick job, and much more pleasant at the calm dinghy dock than in the sloppy anchorage. I again went through the carb myself – my third time doing so – and it was again clean as a whistle, jets and all. I didn’t disassemble the diaphragm pump, though, which I had done my last time going through the carb a few months ago. I reassembled the carb and took it and the reed plate to Chris. He confirmed my assessment that both were good, but then also disassembled the diaphragm pump – and found a tiny, almost microscopic tear in the diaphragm that I missed the first time. He wasn’t sure that was the culprit, but said it could be. He didn’t have a replacement part on hand but I called the Yamaha dealer on Nanny Cay and they did, and they said would be in the office the following day (a Saturday) from 10am to 1pm. I reassembled the engine and puttered back out to Windbird, where Dawn had been nearly sickened by the violent rolling in the bay all afternoon (and neighboring charter monohulls were rolling a lot worse than us). We had been planning to anchor in Lee Bay on the leeward side of Great Camanoe but it was already almost sunset as we crossed the Drake Channel (again rolling badly with the wind directly behind us and quartering swell), so we just pulled into Trellis Bay. I was feeling pretty low, rather doubting that the pinhole in the diaphragm pump was the cause of all our outboard woes over the last six months. Just as we caught the mooring ball, the couple on a charter Beneteau next door called over to us. “You’re from Minneapolis? We’re from Bloomington!” We were pretty busy so I invited them over for sundowners in a few minutes, once we got the boat put back together. They came over and turned out to be a super nice couple who charters for three weeks in the BVI each year, allowing them to do their own "slow cruise.” In fact we saw them several times in the next couple weeks. The guy was nice enough to run Piper and I to shore so we didn't need to launch the dinghy and that blasted outboard. It was a nice end to what had been a somewhat dispiriting day. was that we got the vast majority of our boatwork done during our slow cruise, while doing some really nice hiking, exploring, lobstering, and snorkeling. In Benures, Key, and Pond Bays I found some of my favorite new BVI anchorages - and over the next few weeks I would find two more.